Michael Levin moved from his native Philadelphia to serve in the IDF, and was tragically killed in 2006 in the 2nd Lebanon War. This Memorial Day we salute and cry with all of Israel’s fallen soldiers and their families. thank you for sharing his story. Just so, so powerful. I went to college with his sister. Michael is an inspiration and a great light for the holy nation of Bnei Yisroel. bs”d tears and tears seeing this video. I was in Ulpan Ivrit with Michael, him being in the preperations for the army. So sad. But comforting to know that he is in the best place now. He gave his soul for Am Israel. 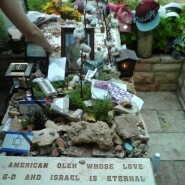 H’ jinkom damo, baruch dayan ha’emet.